5 Maranatha Avenue, Plot SH/24, Commercial District G, New Owerri, Imo State. Maranatha Suites is a 3-Star hotel located at 5, Maranatha Avenue, New Owerri, Owerri. It is top of the list for business and leisure travellers from all walks of life. Maranatha Suites boasts 54 tastefully furnished room within the Premier, Deluxe and Executive Suites category. 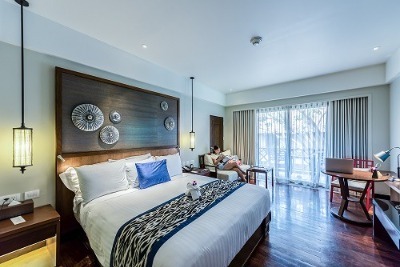 All rooms are spacious and elegantly adorned with features such as: air conditioners, mini fridge, reading desks, hairdryers, room safe and 42” LED TV that can access over 50 channels. Bathrooms are fitted with power showers. The Premier, Executive Suites and Deluxe rooms have king-size, Queens double and Double beds respectively. Guests can also have a view of the beautiful Owerri landscape for their rooms. All guests are entitled to complimentary breakfasts. The complex is well-guarded round-the-clock by armed security personnel with an electric fence and CCTV providing additional security back up. Other facilities at Maranatha suites include: a swimming pool, a high-speed Wi-Fi connection, a bar/lounge, ample parking space, suya spot and an on-site restaurant where Nigerian, Continental and Chinese cuisines are made available. For ease of access, an elevator is available to convey guests. Additional value-added services can also be requested. These services include: room service, car rental, laundry/dry cleaning service, airport shuttle and conference facilities. Q: Does Maranatha Suites offer complimentary breakfast? A: Yes, all checked-in guests are entitled to one. Q: Does Maranatha Suites have a swimming pool? A: Yes, a swimming pool is available on-site. Q: Does the hotel allow parking for free? A: Yes, the parking space is free. Q: Does Maranatha Suites render airport shuttle services? Q: Does Maranatha Hotel have free Wi-Fi? A: Yes. It offers it free to its guests. MARANATHA SUITES is a budget hotel in Owerri, Imo. My state was very fine, the receptionist was very helpful, and smiled at guests and was very professional. The room was well decorated and power was on, for 24 hours all through my stay. The food was also very nice, I enjoyed every bit of my stay at the hotel. This hotel really made me think that Owerri was like London until I stepped out of the hotel. The service and everything is amazing. When next I come to Owerri I will be here again not those other hotels that will just eat your money and forget you. This is the best that I have tried to be very honest and it’s so affordable please increase your price you’re cheating yourself. Maranatha well done. This hotel is properly MANAGED! I literally had to sign up here just to leave a review. From the moment you sit to make payments, you're offered a complimentary drink and a hot towel for your hands. The staff are so warm and friendly and the room decor is very nice and comfortable. Turn around time for food is great as well. I would definitely re-visit!!! I’m very particular about food, my friend stayed here and we had lunch a few times. The Maranatha Suites food was so rich and tasty. Have nice pictures of MARANATHA SUITES?